The harvester working in a forest. Huge swathes of the Highlands are being put up for sale in what is said to be evidence of a massive boom in multi-million-pound timber industry. Scottish-based international forestry agents John Clegg and Co currently has six Highland woodlands on its books, with five of them – valued at around £3 million – under offer. Forestry director Patrick Porteous revealed sellers were attempting to cash in on a buoyant market, while buyers were keen to reap the rewards of a growing industry – worth about £1 billion in the last year to the Scottish economy and employing more than 25,000 people. He revealed developers were also desperately hunting precious available land to start up new plantations and take advantage of rising timber prices. Mr Porteous said a number of landowners who have had woodlands for some time had decided to sell up while the market was at an all-time high. He added: “Mills across the north are working to capacity to cope with demand, and we have just seen Norbord near Inverness undergo a major expansion. All five are currently under offer. There is also 243-acre Balblair Farm Woodland at Edderton, Ross-shire, which is on the market for offers over £675,000. Mr Porteous said they also have woodlands in Moray and Edderton on the market, while another near Kiltarlity, Inverness-shire was about to join the market. Highland economist Tony Mackay said: “While the timber industry perhaps only plays a tiny part of the Scottish economy at the moment – accounting for only 0.2% of Scottish economic output (GDP) – it is becoming more important in the Highlands and islands, wher it now represents 2% of the regional GDP. 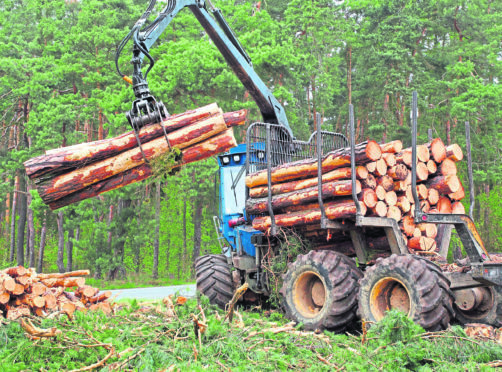 “The forestry industry is very important in the north of Scotland, particularly rural areas. New planting and restocking has increased at about 8% a year recently. Last year prices of woodlands rose by 12%. “I believe that one of the reasons for the massive increases in prices is that some people are looking at safe, long-term investments because of the concerns about the impact of the Brexit vote to leave the EU. Nevertheless, the recent surge in woodland prices is very surprising.